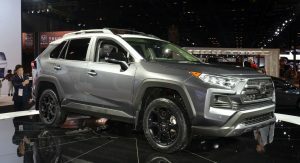 Toyota’s surprise for the 2019 Chicago Auto is the 2020 RAV4 TRD Off-Road, a rugged version of the compact SUV. 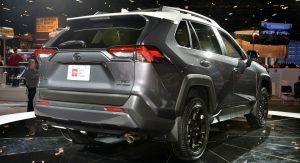 The RAV4 TRD Off-Road comes equipped with an off-road suspension inspired by the Rally RAV4 Race Team, Dynamic Torque Vectoring All-Wheel Drive, Falken Wildpeak A/T Trail All-Terrain Tires mounted on lightweight TRD 18-inch matte black aluminum wheels, as well as exclusive TRD exterior and interior features. Arriving in the fall, the Toyota RAV4 TRD Off-Road is based on the Adventure grade but takes that model’s off-road capability further thanks to the suspension, wheels, and tires engineered specifically for trail driving. 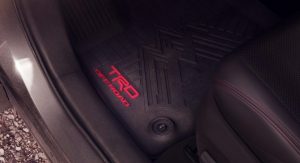 According to Toyota, the TRD Off-Road suspension is designed “to enhance body control and small-bump isolation to help smooth out trails and rough city streets.” It does that thanks to unique red coil springs that are tuned for an off-road focus, as well as re-valved twin-tube shocks that feature new internal rebound springs to improve rebound control. Furthermore, new bump stops help improve body control over large bumps and dips. The standard Dynamic Torque Vectoring All-Wheel Drive can channel up to 50 percent of engine torque to the rear wheels, as well as direct torque to the left or right rear wheel. That results in enhanced handling both on and off the pavement. 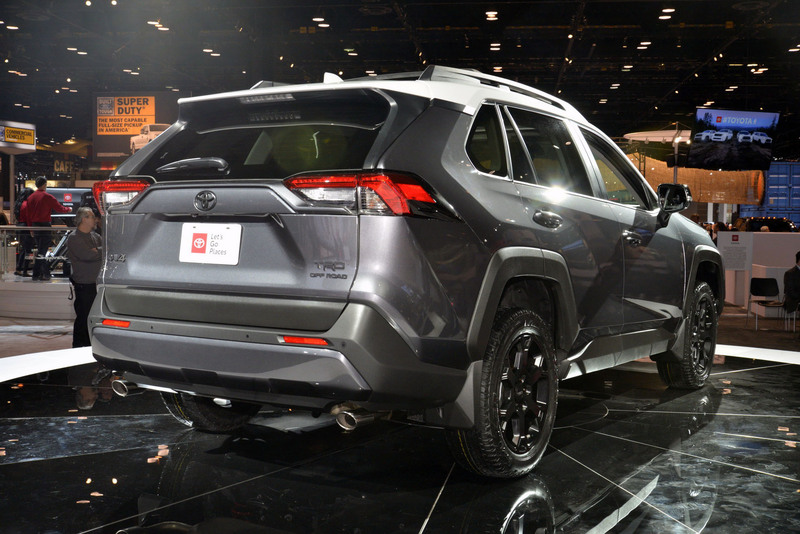 Plus, when AWD isn’t necessary, the Rear Driveline Disconnect optimizes fuel economy. 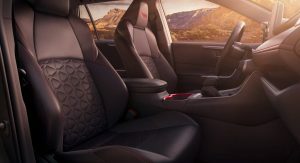 Then there’s the standard Multi-Terrain Select system which allows the driver to maximize traction by selecting one of three modes appropriate for the conditions: Mud & Sand, Rock & Dirt, and Snow. 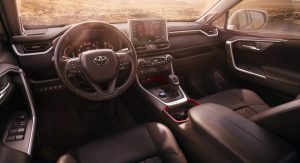 While off-roading, the Toyota RAV4’s Multi-Information Display (MID) will show torque allocation and slip control data. 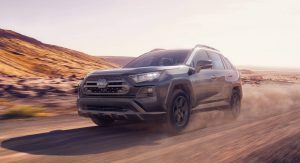 Other standard features of the RAV4 TRD Off-Road include Hill Start Assist Control (HAC), Trailer Sway Control (TSC), and Downhill Assist Control (DAC). 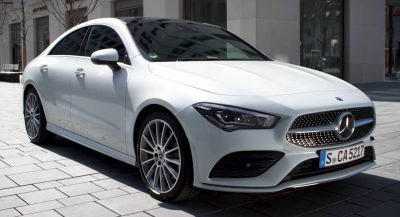 The 203hp 2.5-liter four-cylinder engine is paired with an eight-speed Direct-Shift Automatic Transmission, with the powertrain offering Sport, Normal, and Eco modes. 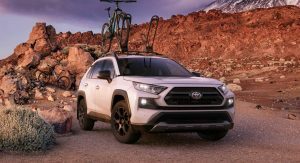 The Toyota RAV4 TRD Off-Road is rated to tow up to 3,500 pounds (1,587 kg), allowing it to haul stuff such as a personal watercraft, dirt bikes or a small enclosed trailer. 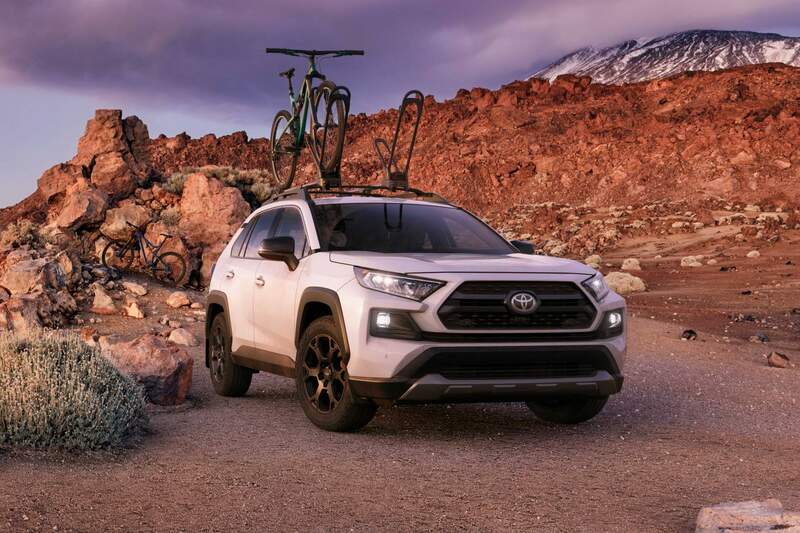 On the outside, you’ll be able to distinguish the RAV4 TRD Off-Road from lesser RAV4s thanks to features such as the large over-fenders, aggressive bumper, and grille designs, front LED fog lights, as well as the high-rise roof rails. 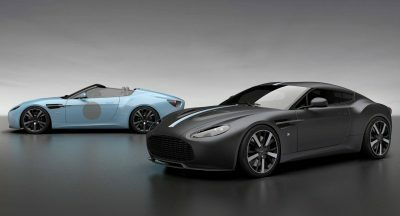 The model is available in an exclusive two-tone Magnetic Gray Metallic with Ice Edge Roof combination and is accented by dark gray front and rear lower fascias. Other available colors include Midnight Black or Lunar Rock (both available with optional Ice Edge Roof) as well as Ruby Flare Pearl and Super White. 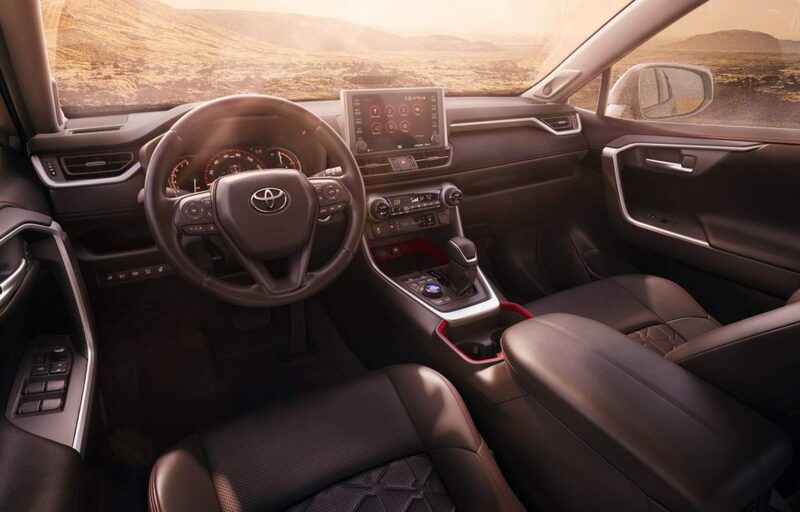 Throughout the cabin, customers get red stitching and red trim accents, SofTex seat surfaces, TRD stitching into the headrests, as well as exclusive TRD all-weather floor mats and rear cargo mat. Where’s that pull out rear bike rack on the concept? That would be useful, many of us do not want the bikes on the roof. It way past time for a integrated system. No redesign Sienna? Toyota, when are you going to redesign your minivan. Your sales dropped a little bit because the aging model is not redesign after 6 year cycle. it’s a shame it’s taking so long, but it’s coming as a 2021 model as per lentz at the nada conference. SMH. 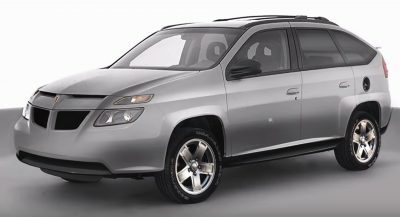 They just want to get the most popular ones like the Camry, Corolla, RAV4, and Highlander. The sienna is also on the popular list as well. 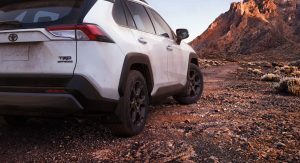 Why the RAV4 to me is better than the CR-V and Forester is because it has more character. Not to mention better packaged for the price (including safety), better looks, tech (for the most part), better ride and handling balance while feeling smaller and more nimble, and more capability. 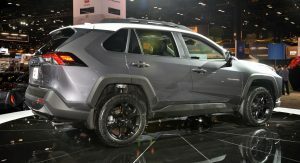 Sure, the CR-V is more family-friendly, the Forester is efficient, and while the CX-5 is very clode, the new RAV4 to me appeals to me a lot more especially within personality for a crossover. 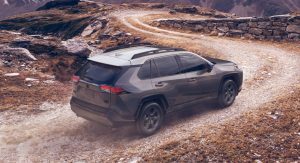 Not that it’s perfect by any means (such as the gas engine being noisy at higher RPMs and lack of Android Auto, and miss the V6…), but I personally would choose the RAV4 over the three. 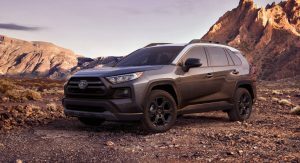 And since the new RAV4 and the Off-Road trim emphasizes on that while bringing up its heritage of being an intruder in Toyota’s SUV range (Car-Based SUV or simultaneous off-roader?) 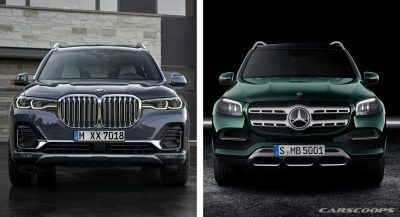 with interesting aspects brought to the table, it really interests me in car-based SUVs a lot other than otherwise uniteresting grocery getters if yet great vehicles. It’s a novel idea to me that’s interesring in the Crossover world. But we’ll see how it pays off. Pathetic marketing gimmick. This is no more an off-roading machine than Mexican Coca Cola with “real” sugar is better for your health. I see it and I want to knock it off its pedestal.